Since 1996, WIN’s integrated approach to career readiness has given more than 10 million learners worldwide the tools, confidence, and skills necessary to excel. Our e-learning solutions include academic and employability skills courseware, assessments and credentials as an important foundation for creating a more effective and efficient system to prepare learners and job seekers for career and life success. The Global Pathways Institute and the Education Commission of the States partnered to convene a diverse set of career pathway perspectives from institutional, state, and national levels. This collaborative effort, in partnership and financial support from WIN Learning, has led to an initial brief that will contribute to the growing efforts in many states to build more effective career pathway systems. The outcome of the initial dialogue has framed the discussion around six essential strategies. 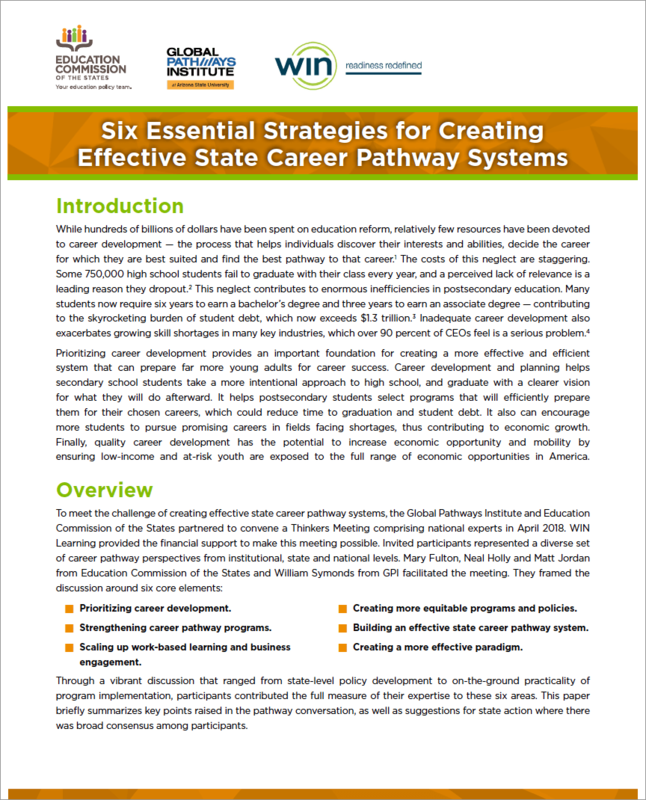 Download the white paper to learn about the current challenges and what states can do to enhance statewide career readiness systems.